In 2022, Kaunas will be declared a European Capital of Culture. This will undoubtedly bring flocks of new visitors to Lithuania’s second largest city. 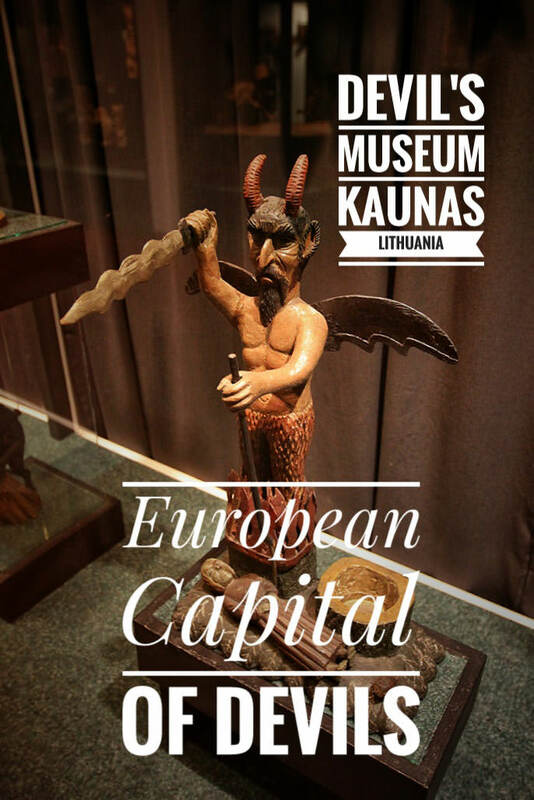 But for one reason, Kaunas is already a capital – not only of Europe but the entire world! 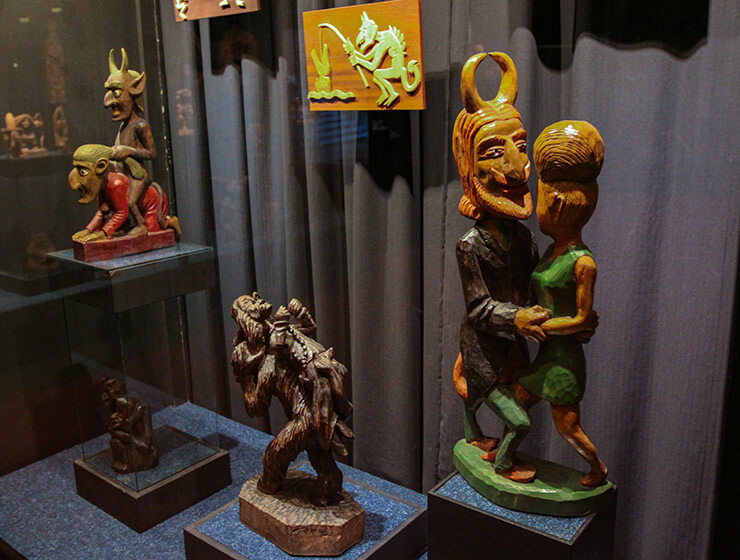 Located 110 kilometers west of Vilnius, the address V. Putvinskio gatvė 64 is home to the largest collection of devil art on Earth. 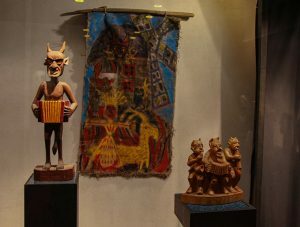 Žmuidzinavičius Museum is better known as Devil’s Museum, and it displays more than 3.000 artifacts depicting the devil himself! Thousands of tourists visit this original museum every year, putting it on the top of the Kaunas must-see list! The unique collection, one of its kind, was initiated by the prominent Lithuanian painter and art collector Antanas Žmuidzinavičius (1876-1966). 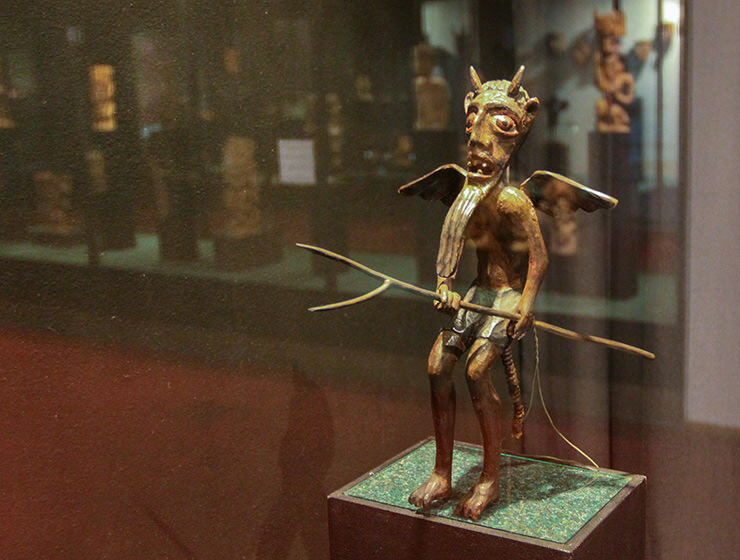 In 1906, somebody gave him a Samogitian Devil as a present. Then he received another one, and another one, and one more. 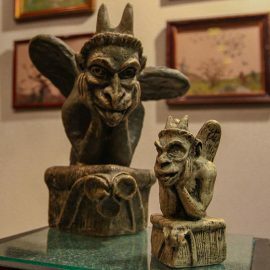 Soon, the painter’s home address became a post box for hundreds of devil statues seeking adoption! He wanted to acquire thirteen dozens of them (169), but in the end, he had 260! 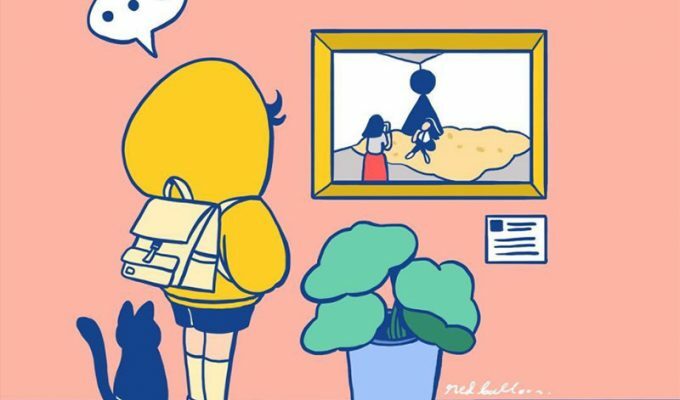 He exhibited them in his house, in the painting studio. Five years before his death, he donated them to the state. The collection was opened to the public after he died but gained huge popularity. In 1982, it had to move to the wing next to the memorial museum. 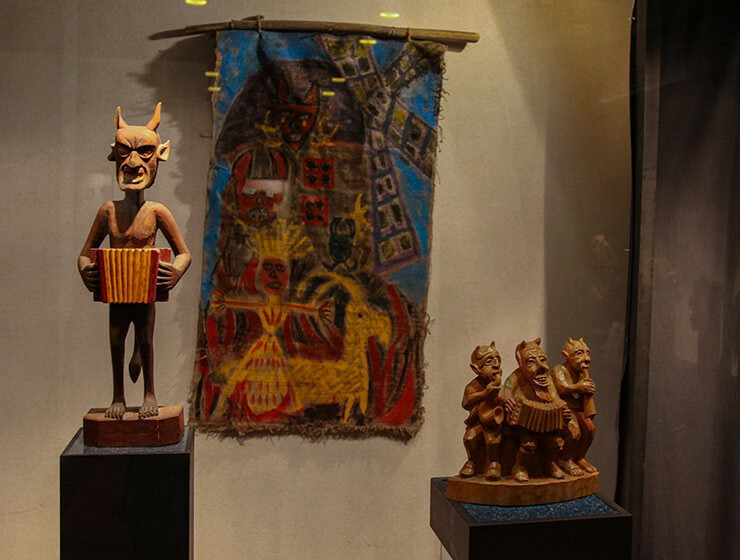 As Devil’s Museum still accepts the donations of the visitors, the actual number of exhibits continually grows. It already surpassed 3.000! 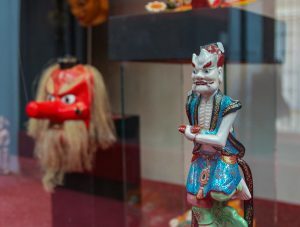 Interested in unusual museums? 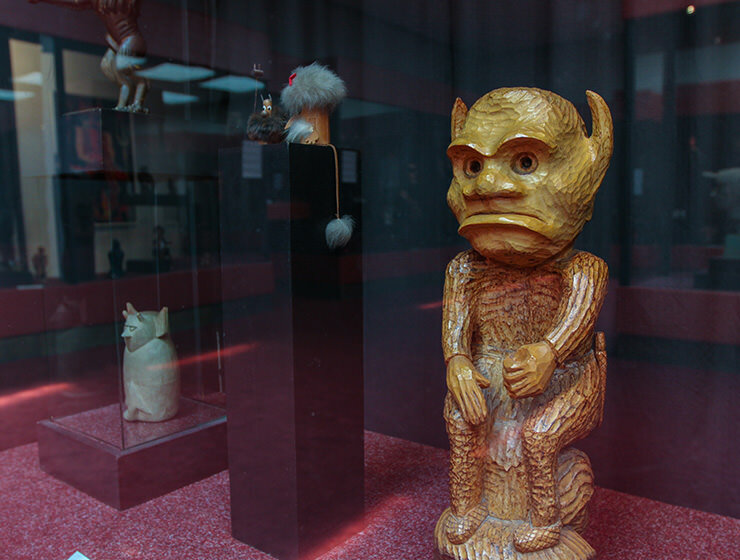 Make sure to also visit the Romanian Kitsch Museum in Bucharest! Devils are fond of music. They invite musicians to their wedding parties and feasts! The cleaning lady carefully polishes the glass cases in which they display the devils. Fingerprints should not obstruct the view. But everybody wants to point at their favorite devil. 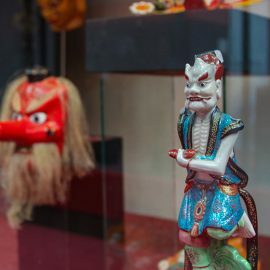 Thousands of visitors every year walk through the three floors of the exhibition, carefully reading the stories about this most unusual museum display. There are many fingers involved. Everyone is brave to point at the devil if he is behind the glass! But these are not just works of fine and applied arts. These are not just piles of souvenirs and masks. 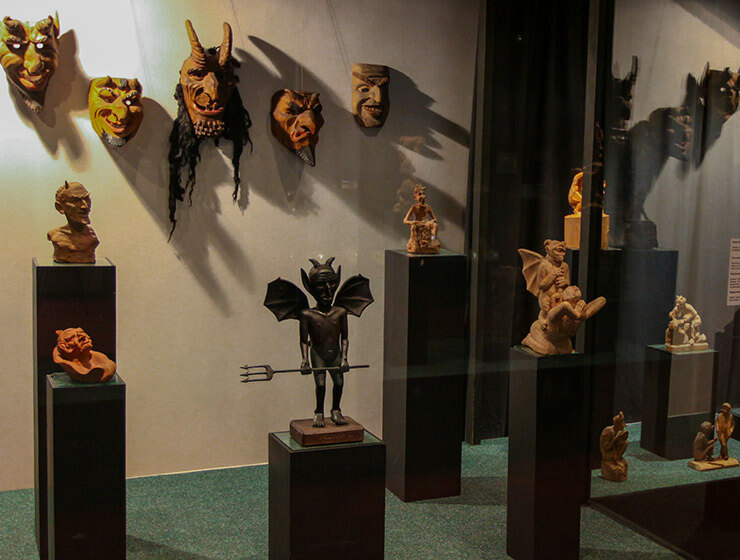 Devil’s Museum provides the thorough insight into the world of the devil – the mysterious and intriguing mythological creature. 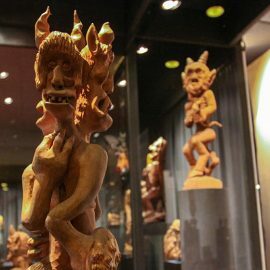 Whether they are painted on silk or canvas, whether they are carved in wood, made of ceramic, stone, glass or paper, whether they come like masks or like usable objects such as pipes or ashtrays, these devils become witnesses of the evolution of explaining the world. 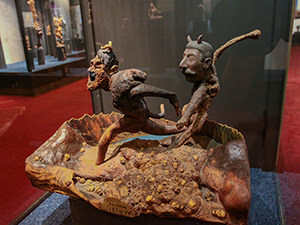 Devil art rooted in paganism or Christianity? 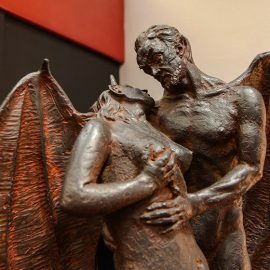 Where does devil come from? Even devils would like to know! In its folkloric version, the devil didn’t follow the rules – he was making hills instead of flat land, creating bats instead of birds, planting weed instead of flowers… Lithuania considered him the richest mythological being, the one directly associated with money. He could even buy one’s soul! Furthermore, people believed that the devil was making the windmill wings turn – that is why millers were rich people. 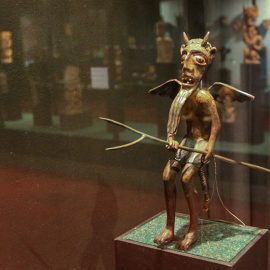 In the Christian tradition, the devil (aka Satan / Lucifer / Beelzebub / Antichrist) was depicted as a fallen angel, the one who rebelled against God. The God, therefore, punished him and threw him into Hell. The priest sawed the Archangel’s body off – you don’t hear this kind of story every day! 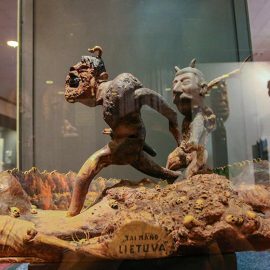 After the priest’s unusual gift, lords of the underworld started arriving in Kaunas, from all corners of the globe. 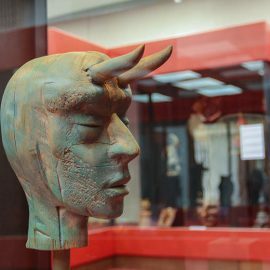 More than 70 countries had some devil art to share, and this included former Soviet republics, but also countries like Japan, Cuba or Mexico. 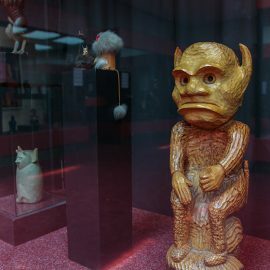 Today, Devil’s Museum covers a broad spectrum of public events connected to the devil as well. 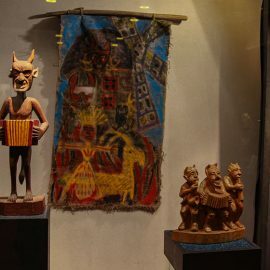 From the Devil’s Feast in Venezuela via Walpurgis Night in Germany to the tradition of the American Halloween, Bulgarian carnivals and St. Nicholas/Krampus in SouthEastern Europe, this Lithuanian museum marks the main festivals where the devils claim their place. 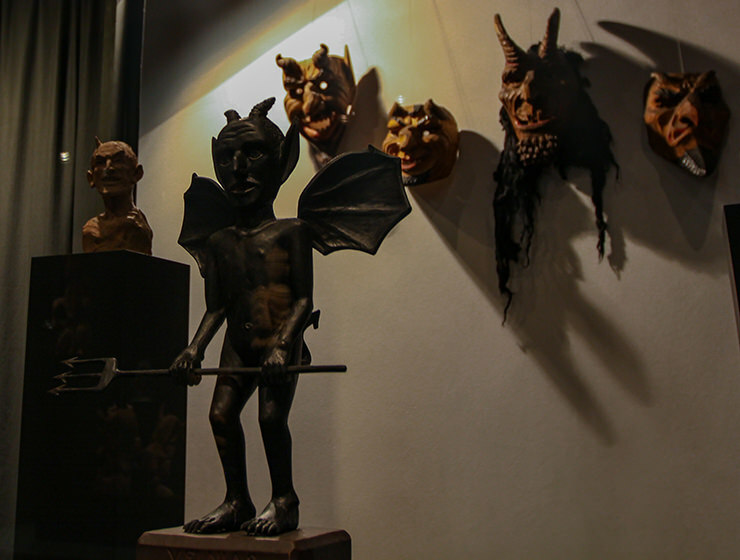 In Lithuania, during Shrove Tuesday festivities, the revelers wear masks and costumes, frequently the devil ones, while they try to frighten and intimidate. They create noise, dance, and sing. At the end of the event, they burn a figure of the woman (in different regions of Lithuania, they call her Kotre, More or Čiučela). This should symbolize the end of the winter. Nobody counted the Lithuanian names for the count of the darkness, but experts estimate that there are more than a thousand! Kipšas (the dickens), Pinčiukas (the deuce), Bevardis (the nameless), Bekelnis (the trouserless), Biesas (the evil force), Ponaitis (the young master) and Negerasis (the not-good one) are just some of them. More than 5.000 Lithuanian legends and fairytales mention the devil, and about 400 Lithuanian places bear the name of the beast – Velnio Duobe (Devil’s Hole), Velniaraistis (Devil’s Bog) or Velniabale (Devil’s Swamp) are just some of the places that let the devil into their world. However, even if the devil likes bogs, swamps, marshes and puddles, it is believed he actually lives under stumps or rocks. He loves to sit on large stones and boulders too. More than 150 boulders with footprints are known in Lithuania, and it is believed that more than half of them belong to the devil! One can find the devil at mills or crossroads as well, especially if one calls his name at night or whistles. 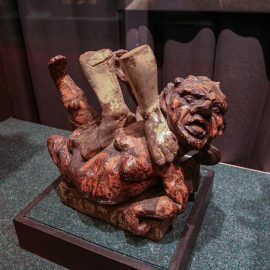 Besides the instructions on how to invite the devil, Devil’s Museum teaches its visitors also how to defend oneself from the spell-binds or how to make the elixir of youth that sent many witches (devil’s brides) into flames during the Inquisition times. Yes, there is an actual recipe on the wall! So now when you know that you have to come at the crossroads at midnight, say “Our Father” backward and whistle for the devil to arrive – will you actually recognize him? Lithuanian tales tell us that he could appear as a horse, a pig, a ram or a goat. He could also appear as a man. The devil could manifest himself as a nobleman, a hunter, a priest or a German. He may be dressed in black and red, but also in green. He could appear as a shoemaker, a musician or a blacksmith. He may be young or old. But if he is young, he will be extremely handsome. 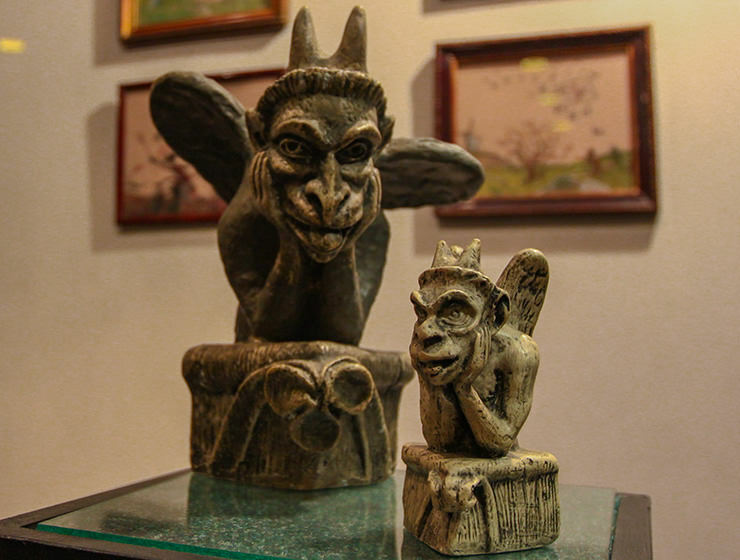 What are Stalin and Hitler doing in Devil’s Museum? 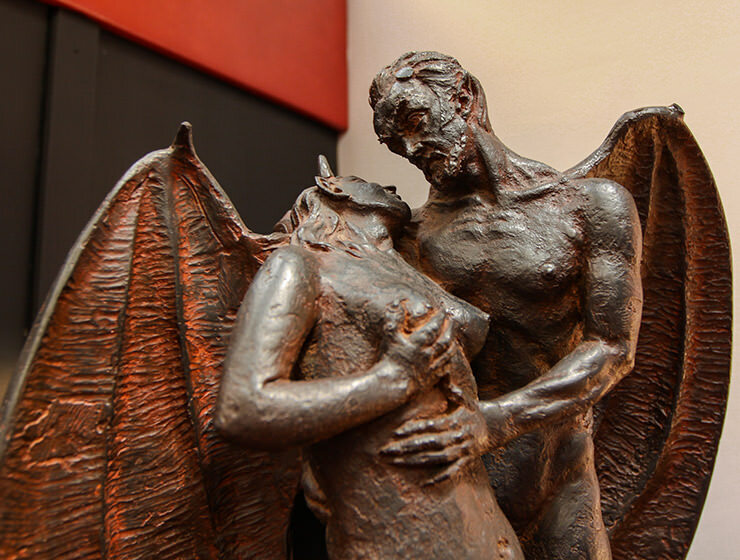 The power of the devil is obviously very seductive. 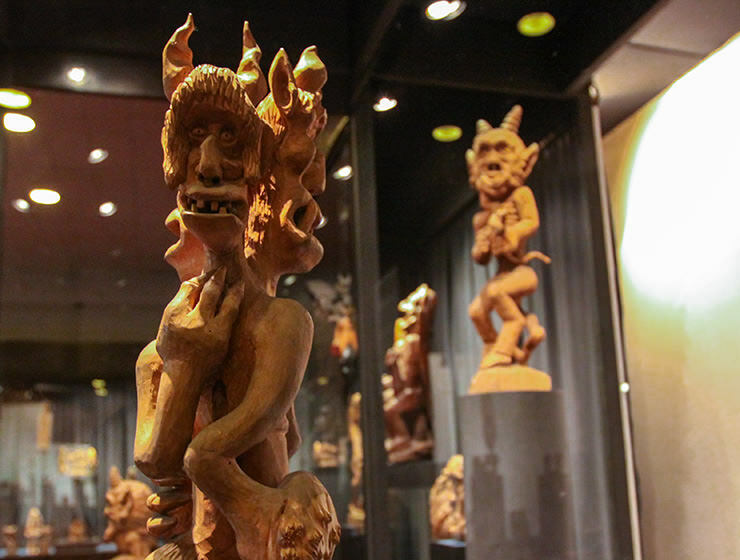 Two horned devils in Devil’s Museum are easily identifiable and attract visitors’ attention. 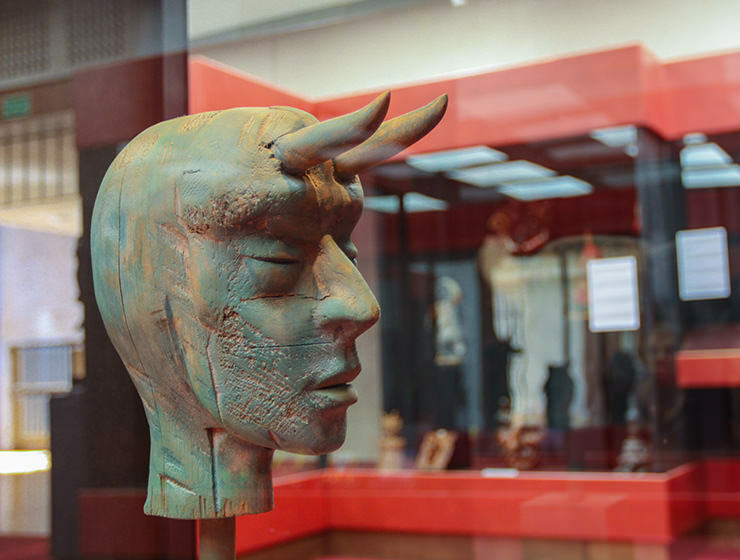 In 1975, the artist Kazys Dereškevičius created a sculpture representing the historic figures of Stalin and Hitler, but with devil’s horns protruding through their foreheads. 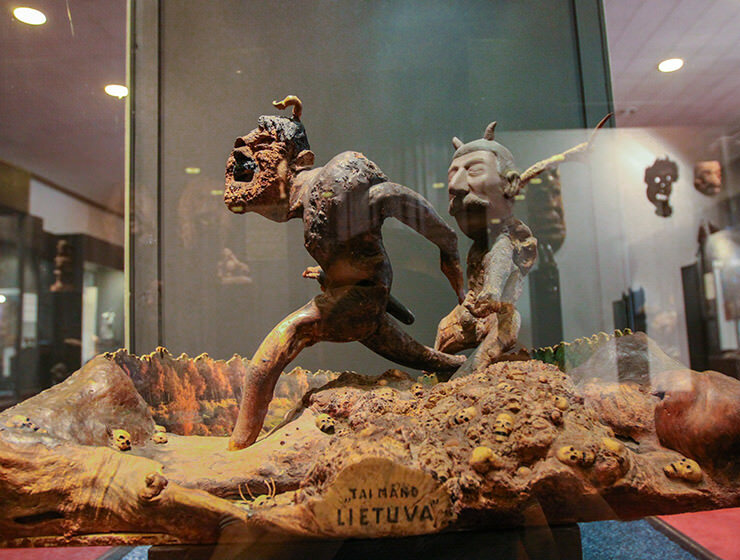 The artwork “My Lithuania” shows two dictators running over a mountain of human skulls. The artist was referring to the events between 1939 and 1941 when Lithuania and other Eastern European countries were annexed to the Soviet Union. Stalin and Hitler brought the pain to the innocent people and affected the lives of millions. Sure, the devil and death are often associated with each other. But the connection between the two has never been as prominent as in the case of the two infamous European executioners. 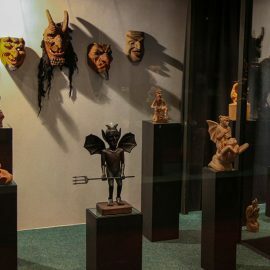 As quite a unique project, Devil’s Museum should find its place in the ultimate Kaunas must-see list! Not widely known, but still a precious town attraction, this place seduces tourists for more than a half of the century! 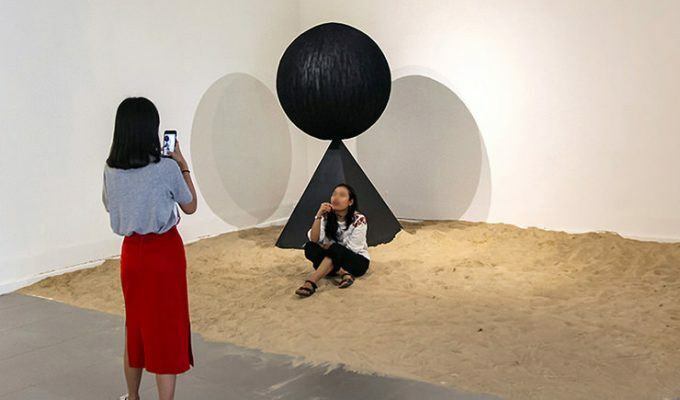 Even if the pressure from the visitors is not the same as it was in the times when museum space had to go through enlargement, it seems that Devil’s Museum appeal is not dying down easily. Kaunas already received the European Heritage Label as well as the title of UNESCO City of Design, mainly thanks to the numerous Art Deco buildings they constructed during the interwar. With the logo of the European Cultural Capital in 2022, Kaunas will orbit itself again into the skies. At least for a year, the fallen angels of Devil’s Museum might get their wings back. Searching for a place to stay in Kaunas? Travel Fogginess or Travelers' Confusion : Where the Heck am I? This is the perfect place to bring my little devils! 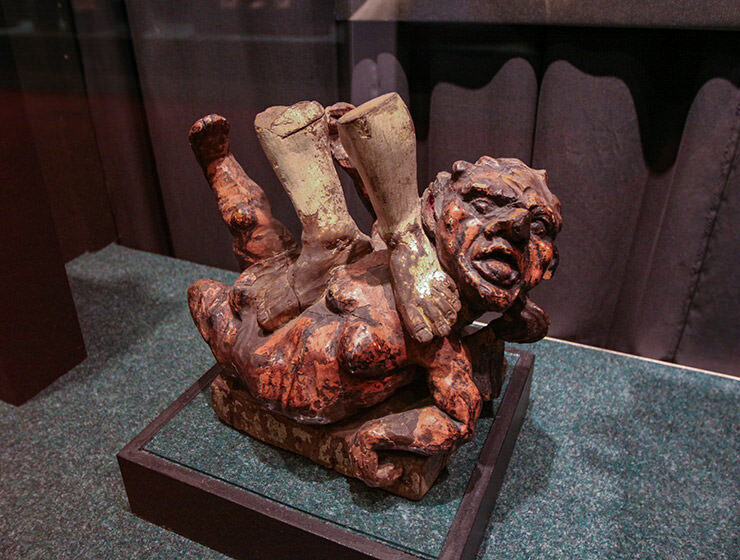 I was fascinated and surprised reading your article about the Devil’s Museum in Kaunas. I love all the legends about the Devil, especially about the windmills and a money flow associated with it. The story about Archangel Michael is very interesting and Stalin and Hitler depicted as two devils are so true. The artist, who created these figures, was very brave as he created it in 1975, many years before Stalin was recognized in Russia as a bloody autocrat. Kaunas is on our places to visit now. I am glad this article motivated you to visit Kaunas! This place looks fascinating! 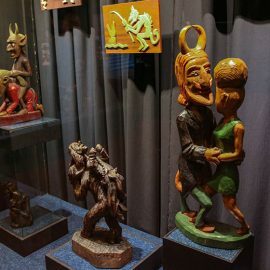 I love stumbling across unique little museums like this, and now definitely am going to add Kaunas to my list of places I want to visit. Thanks for sharing! Great to hear Kaunas made it to your bucket list! Pipeaway loves to discover such small jewels too!